30 Years of BALA Design Trends: What’s Changed, What’s the Same? 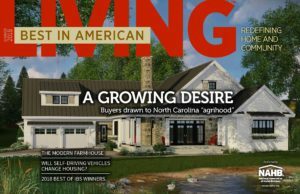 Garages: One thing that hasn’t changed is the prevalence of garages—nor the continued attempts by architects and builders to lessen their dominance in the exterior appearance of the home. Over the years, architects have achieved this in many ways: designing side-entry garages, separating garage bays, cantilevering a second floor out over the garage, or by giving more emphasis to the front door. Porches: While architectural styles are varied across the country, one consistent feature that has stood the test of time is porches. Porches provide an architectural detail that ties homeowners to their communities. Unlike backyard decks, front porches create a connection with others, making not just the house, but also the neighborhood, feel like home. Neighborhood Amenities: Over the decades, builders and designers have continued to include community amenities that allow residents to connect with one another, whether they are homeowners or renters. These features can include walking trails, parks, community centers, and lakes. TNDs, or Traditional Neighborhood Developments, are another way planners have attempted to get people walking and interacting within their communities, rather than simply getting into their cars each day. Aging-in-Place: Mixing services and amenities—stores, the post office, the community center—also creates convenience, allowing people to remain in their home as they age. Aging-in-place is a concept that has existed throughout the BALA awards but has increased significantly since baby boomers began retiring in large numbers. As they age, boomers prefer to stay in their homes and be able to do so as comfortably and easily as possible. Lifestyle Layouts: Another trend consistent among the BALA winners is open floor plans and more informal spaces in the home. Over time, the full walls separating rooms have come down and have been replaced by half walls, columns or painting details that still define the spaces but allow the rooms to flow together more easily. Classic Exteriors: Even as interiors evolve, home buyers still love classic exteriors. These include authentic representations of classic architectural styles including Tuscan, Spanish, Craftsman, Tudor, Coastal Cottage, Bungalow, Colonial, and the like. He noted, however, that today there is more and more contemporary architecture because of the newer generations of homeowners who favor this look over the more traditional styles. Technology and Building Systems: With the invention of smart phones and tablets, lighting, security, HVAC and TV can now be controlled remotely by the homeowner while they are away from the house. Home builders have increased their use of incorporated building systems—such as modular and panelized—to help to cut costs and building time. This became even more prevalent during the economic downturn when budgets were tight and full-time employees were fewer. Advancements in Green Building: The continuous evolution of energy-efficient building sciences is also changing the way builders and architects are designing homes. An increased emphasis on solar energy and common-sense designs to help with interior comfort, such as low overhangs and shaded windows, started making strong appearances in the early 1990s. Bigger Kitchens, Smaller Master Baths: Today you will find everyone in the kitchen, making it a larger and greater part of the house’s core. Because of this, kitchens have gotten bigger over the years and are being incorporated more with the family room so as not to separate the person preparing the food from the rest of the family. As kitchens have gotten bigger, master bathrooms have become slightly smaller. However, the amenities in bathrooms have become more luxurious. Flex Space: Although the disappearance of formal rooms has been a consistent trend, builders and architects are more recently factoring in flexible living spaces, often called flex spaces, so the home can adapt to the homeowner’s long-term needs as they change. Indoor-Outdoor Living: Outdoor living spaces are no longer just for the areas of the country with nicer climates. Homes everywhere are now incorporating the outdoors to expand usable area for the homeowner.